One of my favorite vegetables, fresh corn on the cob, is in season in the USA from May to September. 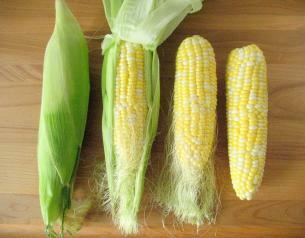 When buying corn, the husks (outer green covering) should be bright green and fit snugly around the ear of corn. The kernels should be in tight rows right to the tip of the ear of corn, and be plump and milky (if you accidently pop one!). While in the grocery store, it is perfectly acceptable to peel back the outer green husk to check and see if the corn looks OK.
You should peel the husk off the corn just before you cook it. To do so, peel back the husk, hold the peeled ear of corn in one hand, the husk and stalk in the other and then snap off the stalk. To remove the “silk” (the white hairy threads just under the husk) wet a paper towel and wipe down the corn – from the tip to the stalk end. Be sure to totally remove all the silk as it is really not pleasant to serve corn on the cob with the silky threads still attached. Once the husk and silk have been removed from the corn, it is officially “shucked”. You can also cook corn in a pressure cooker which is quick and (many people tell me) quite simple to do, but I still have yet to buy a pressure cooker. Be sure to have a look in the comment section below as many experienced cooks have added some great suggestions on how they cook corn. Cooking corn in the microwave is my preferred method. I am not too fond of pots of boiling water heating up my kitchen on a hot summer day. This method is good when you are cooking only 2 or 3 ears of corn. If you are cooking more, you should choose one of the other cooking methods or do it in batches in the microwave. Place the corn in a microwave safe dish and add about 2 Tablespoons of water to the dish. Cover the dish with plastic wrap, making sure to leave a small opening (a steam vent) in the corner to let the steam escape. Microwave the corn on high for 4-to-6 minutes – depending on the strength of your microwave. 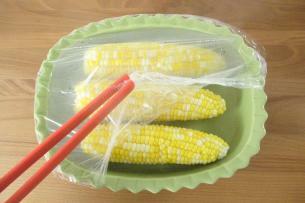 Carefully remove the plastic wrap from the corn. There will be a lot of very hot steam escaping, so you probably should use a pair of tongs to remove the plastic wrap. 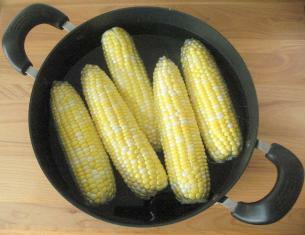 Place the shucked corn in a large pot. Cover it with COLD tap water. Cover the pot and set it on the stove. Bring the pot to a boil. Once the pot has reached a boil, the corn is cooked. Fill a large pot half way with COLD water. There should be enough water in the pot so that when you add the corn, it is covered with water but not overflowing. Bring the pot of COLD water to a boil. 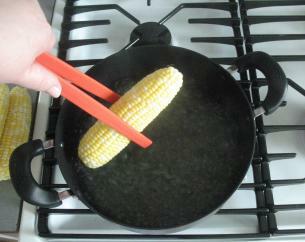 Using a pair of tongs, carefully drop each ear of corn into the pot. Cover the pot and return the water to a boil. Boil the corn for 5-7 minutes or until done. How do I know when it’s cooked? The cooking times listed above are general cooking times. Some people eat corn raw, and some dunk it in boiling water for 30 seconds to just heat it slightly. The simplest answer is to taste the corn to see if it cooked to your liking. Over-cooked corn does become really tough and it is also pretty rough on the digestive track! Should I add Salt or Sugar to the cooking water? Corn is naturally sweet. Some people add 1-2 teaspoons of sugar to the cooking water to sweeten it even more. That’s totally up to you! 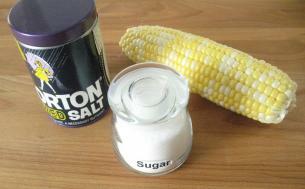 Salt, on the other hand, should not be added to the cooking water as it will toughen the corn. Sprinkle it on after the corn is cooked. When blanching vegetables, like asparagus, you plunge the partially cooked asparagus into a bowl of ice water to stop the cooking process. If you are cooking the corn for other uses than eating it off the cob, you may be tempted to submerge it in a bowl of icy water to cool it off. Don’t! It will cool the corn off BUT it will also turn your corn very soggy. Cook and eat corn on the cob the same day as you buy it. 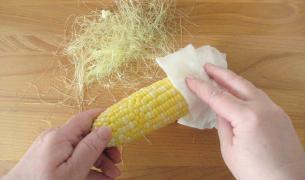 To freeze fresh corn on the cob you must remove the corn from the cob first. It can be cooked or uncooked when you remove it from the cob to freeze. To remove the corn from the cob, a serrated knife works best. Corn can be frozen for up to six months. I really like these things! They do come in all shapes and sizes. You just jam them in either end of the corn cob. If the corn is really hot, they protect your fingers. They also have other uses. I actually used the big ones in the photo below to help peel a mango! One way to butter corn is to slide the corn in a circular motion over a stick of butter. Alas, the whole family really has to agree to this method! Or you could butter a piece of bread and roll the corn in the slice of bread. Corn on the cob is great microwaved in the husk also, as a plus no extra dishes. For family cookouts, we always soak the corn and then cook it on the grill. Easiest way to butter the corn? Put a couple of sticks of butter in a jar… pour hot water over the butter. 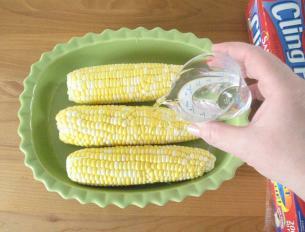 The melted butter will sit on top of the hot water, and then you just dunk the whole ear of corn into the water. Voila! Perfectly buttered corn on the cob! I can’t remember a time that I didn’t have corn in my fridge. I like every method you described and one of my very favourites is in the husk, on the bbq – so good. No, you don’t need to remove the silk before cooking in the husk. Simply cook whole, and peel back husk and silk afterwards. Careful though, it will be hot! When we cook on the BBQ, we like to wrap it in foil. Hi Veronica, I’m not sure my fingers would survive! Can you cook corn in a roaster for a large number of people when stove top not available? Sorry, but I’m not sure what you mean by a “roaster”? Ever hear of the Butter Family? Butter boy and butter girl are GREAT ways to butter corn on the cob – they are like mini – butter deodorants – sounds icky but that’s what they look like! and they work fantastically well! I love mine – google it! Hi Corn Lover, The Butter Family are a riot! I’ll bet they do a great job – even if they look kind of “corny”! to cook 1 or 2 ears, i first snip off the loose silk and leaves from the tip of the husk, then stick the whole ear (husk and all) in the microwave for 4 minutes on high (try 6 min for 2 ears). it stays hot while i eat the rest of my meal, and the cooked silk and husk comes off like a breeze when i’m ready to eat it. Is eating corn “on the cob” an American tradition or is it eaten that way around the world? I love corn on the cob! It’s not just an American tradition though. in Egypt it is grilled and served on the cob. Europe doesn’t have the tradition of eating corn at all. It’s regarded as animal feed. Not sure about other countries…. Can you freeze corn on the cob and then reheat it to eat on the cob- or must you prepare it off the cob? We really enjoy it on the cob best. eating “corn on the cob” is certainly a tradition here in he UK, though as Beck points out, it’s rather looked down on in other part sof Europe. Personally my favourite way is done on the BBQ (grill) – its best to sok the husks in water, then they’r great. I have the same questionas Pat – we are havinga graduation party for my daughter and would like to have corn on the cob with as little work as possible – can you cook it in an electric roaster? 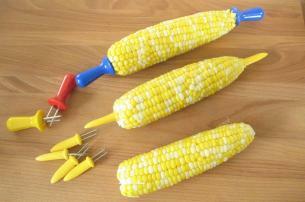 We will probably be doing about 45 or 6 dozen ears of corn and do not want to cook it in the house or on the grill. Hi Bridget, that sounds wonderful! Jervais (and Pat), that would clearly not be an option for cooking vast quantities of corn! I was hoping someone with electric roaster experience would jump into this conversation! Cooking on a large scale for many people can be very tricky. Perhaps you could partially cook the corn the morning of you event and then just warm it on the grill. Good Luck! You can actually freeze con ON the cob. All you have to do is blanch it first. Drop shucked ears of corn into boiling water for 2-3 minutes. Then once it’s cooled you can freeze it. My mother-in-law makes the best corn I’ve ever tasted and she used to freeze batches of it for me ever summer. Fresh corn on the cob all year long! YUMMY! For fresher crisper corn on the cob, don’t boil the corn, steam it! Place the ears on end in a tall pasta pot with an insert, put in about an inch or two of water (and about a tablespoon of sugar–my grandfather’s secret ingredient) and steam for about 10 minutes. Once you try this you’ll never eat boiled corn again! Shannon you must have a really big freezer! RJ, I actually love crispy corn on the cob kind of “crispy”. It adds a perfect texture to Tex-Mex Salad! Lol, I did have a big deep freezer on my back porch. She also had a standing freezer where she kept all the foods she froze herself, the entire bottom freezer drawer was dedicated to corn on the cob. WoW! You really do love corn! My kitchen is no bigger than a postage stamp so an extra freezer is not an option. (That’s city living for ya!) In fact most people are really amazed at how small my kitchen actually is. Particularly after seeing all the videos that I film there! My kitchen wasn’t very big but I had an enclosed back porch so we kept the freezer out there. My exmother-in-law would give me a couple of bags of corn when we would see her. I do love corn on the cob though, I could seriously eat it every single day and never get tired of it. My husband would kill me though, lol. 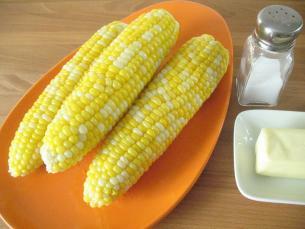 In Japan people eat corn on the cob, or toumorokoshi as it is caled in Japanese. It’s most often eaten grilled during summer festivals and enjoyed by almost everyone. Hi David, The last time I was in Japan it was wintertime and clearly no corn on the cob was in sight! (I must say, one of my most memorable travel experiences was a visit to Nikko while it was snowing!) Glad to see summer festivals and corn on the cob seems to be an international treat! I want to freeze corn on the cob for my daughter. She is not here during corn season so I wanted to suprise her when she comes home in October. Whats the best way to freeze it on the cob? OR remove the corn from the cob first. It can be cooked or uncooked when you remove it from the cob to freeze. To remove the corn from the cob, a serrated knife works best. Thanks for your response….So after you blanch it and freeze it what do you do before you eat it after you take it from freezer? Thaw it and reheat it or microwave it? I want it to taste fresh for her. I have a vacuum sealer to seal them for freshness in freezer. I am so excited to try this for her and suprise her. Cook it as you normally would. Put it into water, bring to a boil and let boil for 1-3 minutes depending on your prefered level of doneness. I prefer just one because I like it as fresh and crisp as I can get. I’ve never microwaved it so I’m not sure how it would work out. This may sound strange but lately I’ve been enjoying raw corn. It all started when I tried this fabulous salad. Since then I have added it to my Sante Fe Chile Recipe and it was noticeably different than just adding a can of corn! I’m in Korea, and corn is quite common here in season, but I rarely see people eating it on the cob. I love all kinds of corn, but my favorite way is roasted in the oven. I don’t know if it’s the same as queried above when people mentioned an electric roaster, but I simply put shucked ears in the oven. I set the oven to about 350 and put the corn in for about 45 minutes, although this time varies. The corn is very different from “normal” corn: the outsides of the kernels become almost crunchy, and if done properly, the insides of the kernel become sweet and chewy. It’s also good to leave the husks on the corn when you put it in the oven, but then it doesn’t become as crunchy. I always keep a good eye on the corn so as to avoid it becoming burned. My grandmother taught me to do this, and it’s really more of an art than a science as you can’t really give precise cooking times. Thanks Roger for the great recipe – from Korea no less! Your Grandmother taught you well! Ken, first I would suggest that you check with the manufacturer of your particular pans. “You can wash aluminum pots and pans in hot, sudsy water, just as you would your other dishes. Some aluminum may even be dishwasher safe, but never assume that aluminum is dishwasher safe unless it’s explicitly marked as such. Even if you wash them thoroughly, you’ll likely notice over time that your aluminum pots and pans develop deep gray or black stains—these stains show up when aluminum comes in contact with hard water or alkaline foods. Fill the pot or pan with a mixture of 1 quart of water to 1 tablespoon cream of tartar (an acid salt used in cooking and sold in most supermarkets). Bring the solution to a boil and let simmer for five minutes. Pour out the solution and scrub and polish the pan with a nylon scouring pad. Anodized aluminum is aluminum that has been made stronger through a chemical process. Though physically stronger, anodized aluminum is more sensitive to temperature and is not dishwasher safe. Always wash it with a nylon scouring pad and hot, soapy water—do not use abrasive cleaners, as they can scratch the surface of the cookware. Fill the kettle with a mixture of equal parts water and white vinegar. Ken I hope this helps. In Colombia, corn is often grilled on the cob, with the husks and silk removed. A piece of the stalk is left on for a handle. And of course, plenty of butter and coarse salt. Joe, that sounds delicious – thanks for sharing! Abrasive Technologies is the world’s leading manufacturers of products that Abrasive Brushes, Fickert Brushes, Chamfering Brushes and Giano Finish Brushes. 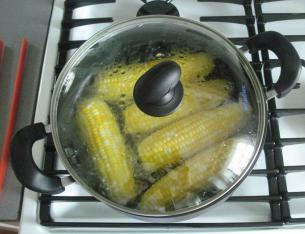 Just drain the water from pan you cooked the corn in, add butter, roll cobs around and its ready to eat!! I am definitely going to have to give that a try! Sometimes when I cook corn (by boiling) it tastes powdery. Can anyone tell me why corn tastes powdery sometimes? Is it overcooked or undercooked or is it bad corn, or some other reason? I have wrapped shucked clean corn in wax paper and cooked in the microwave for a few minutes instead of heating up the kitchen boiling a pot of water. Excellent directions and pictures. I often use the microwave method when I’m in a hurry, but I grill corn on the cob, too. Yum! After your corn cools, wrap each in alum foil. and freeeze..and when you heat, just keep the foil on and cook in boiling water for 15 minutes..
Tiffany, I think I would rather remove the silk when the corn in cold (before cooking) rather than hot from the micro wave! Dorn, hmmm, that’s a new one. Sorry to say, I have no clue, but my guess would be undercooked. Babs, Great hot weather tip! Betty, I actually cut it off the cob before freezing, but I will have to give your method a try. In Mexico they have a corn on the cob you can buy from street vendors. It’s in a large steamer (I think) cart and is on a stick sometimes. It’s dipped in mantaquila (which they say translates to butter but it tastes different to me) and then sprinkled with grated chihuahua cheese. It’s a different sort of corn than here in the US but very good. That sounds soooo good! I have never had chihuahua cheese. It is similar to Parmesan cheese? We frequently have large BBQs at our summer place on the river. There is never room on the grill for corn though, as it seems to always be full of meat – steaks, kabobs etc. I like to shuck corn and lay individually on a sheet of foil. Butter profusely, then wrap loosely, tuck ends under. Can put as many as you want on oven racks, roast at 350 degrees. From a few ears to couple dozen will vary time from 45 min to 1-1/2 hrs. Test one if roasting a large batch and you aren’t sure. It is mouth-watering tender and so sweet. Always a hit. Thanks Karleene! This is a great tip, particularly for those expecting a crowd! Can anyone tell me if Corn on the Cob is good to eat the next day after it’s been cooked? Left over corn on the cob is great to eat the next day. It won’t be quite as good as freshly cooked. I often cut it off the cob and add it to salads or chili or just add some butter and salt and give it a zap in the microwave. I use a 22qt pressure canner / cooker. It will hold 5 1/2 – 6 doz. ears (depending on size of ears). It only takes 2 1/2 cups of water and only about 45- 60 min. to cook. I have 5 daughters and 13 grandchildren, so when we have a picnic it really helps. For just me n my wife I just use a 4qt or 6qt it only uses 1 1/4 cup of water and 30 – 45 min cooking time. I think that if you put the cooked corn in a roaster n filled it with water it would keep ok. This tip came from the “Recipe 4 Living” website: Melt a stick of butter in a pan of water. The butter will float on the top. Dip cooked corn cobs into the pan. The butter will stick to the corn; the water doesn’t. Don, I am shocked that corn takes that long to cook in a pressure cooker. I do not use one, but I do remember it taking my mom about 10 minutes to pressure cook about a dozen ears of corn. Babs, I love it – great idea! You CAN freeze corn on the cobb! Remove the husks and then the silk with a DRY paper towel. NEVER let water get on it. Wrap each ear individually in foil and pop in the freezer. When ready to eat, you pull out the desired number of ears and cook by a method you desire. The trick here is to never let water touch the ears before freezing. Thanks Julie – great tip! I really enjoyed reading this article. Thanks for such informative article! I usually fix my corn on the cob in the microwave. Wash ears and wrap in waxed paper. Cook about 4 – 5 min for 2 ears, longer for more ears. And, yes, we eat left over corn…just re-heat in the waxed paper or wrap with fresh sheet. As far as the electric roaster, I haven’t tried it but a family member cooks the corn for large gatherings and then puts it into an electric roaster with an inch or so of hot water and corn stays nice and hot. As far as corn tasting “powdery”, it’s because of being under-cooked. Hope these ideas help. It seems like a lot of people have success with cooking corn in wax paper – I really do need to give it a try! I would like to point out that many microwaves, including mine, says to always place the food on a dish and not directly on the glass turntable. Hi, Kathy….Yes, I think most microwaves say to put in a dish but I just put the wrapped ears directly on my turntable. Otherwise, I usually use a paper plate (not the foam one, though as it might melt). Hope this clarifies. For those who want large quantities of corn. 1-Galvanized garbage can. 2-Scavenger for Propane tank, Can be rented from BBQ/Party rental stores. 3-Shucked corn. 4-Water. The can fits ontop of the propane scavenger and will hold the total weight of can and water. Some have a baffle around the scavenger to keep the wind from blowing out the flame. Thats the way we do it at the FIRE HOUSE…Tom.. I think your method is best left to more experienced cooks! We always just freeze it whole in the husk, then thaw a while and microwave in the husk. The silk comes off easily after that, although you have to be careful of the steam. And as my husband says, it kills the corn worms, too! 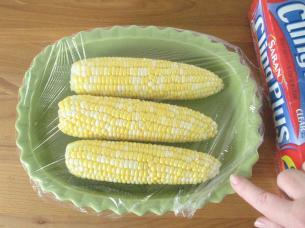 Sometimes we grill the corn – first husk it, then slather with mayo and Cajun seasoning, then wrap in foil. According to Cub Foods, they throw out approximately 50% of their sweet corn because it has been partially peeled. They can not sell it if the outer husk has been peeled away and other customers will not buy it during the day it has been put out even if it looks all right. Great tips! Corn on the cob is one of our favorite foods for grilling. We like to soak the ears of corn in a large cooler filled with buttermilk and water for a few hrs. Toss them on the grill while still in the husk, they cook great and taste wonderful. Other than making the husks very wet does it actually do anything to the taste and texture of the corn? I actually wouldn’t recommend using the plastic wrap for cooking because of the BPA chemical in the plastic wrap that would leach into the water and the corn. Glass lids are great though. Thanks! I just read this and dumped out my boiling water. I was adding salt!! And I wonder why my corn has been crappy! Now I’m adding sugar as you suggest. Can’t beat the internet. Glad I found your post here. Thanks again! 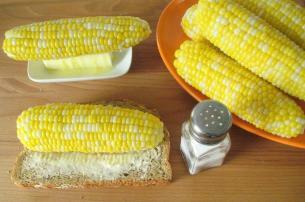 after grilling corn, you won’t believe this, but try putting some mayonaise and then sprinkle mexican parmeson cheese. guaranteed you wont go back to your old ways. I freeze corn on the cob to use during the winter months- I shuck the corn and then I put them in vacuum seal bags and seal them and throw them in the freezer. They taste just liked you picked them. Plastic wrap? LOL. Don’t cook anything in the microwave that’s wrapped in plastic unless you want a nice melted plastic sauce on top. Wax paper, baby, wax paper. You put plastic wrap over dishes to store them in the fridge, you don’t cook with it. LOL.